I love a good barbeque sauce. Slathered on chicken, beef and pork; as a topping for juicy hamburgers; and a dipping sauce for fresh-cut fries. There’s always a reason to put use Bar-B-Q Sauce on my plate. And my all-time favorite Bar-B-Q Sauce is Stubb’s. All natural and all gluten-free, I love Stubb’s Bar-B-Q sauces since they do not contain any high-fructose corn syrup (it’s surprising how many Bar-B-Q sauces do contain high-fructose corn syrup as the first ingredient… YUCK!). I also like that on average Stubb’s Bar-B-Q Sauces have on about 20 calories per tablespoon… making it a guilt free way to add some flavor to grilling and dipping. The Stubb’s Bar-B-Q line-up will have you thinking up creative ways to use Bar-B-Q sauce with all of your gluten-free meals. The varieties are fantastic too: Original, Spicy, Hickory Bourbon, Sweet Heat, Smokey Mesquite and Honey Pecan. And with the autumn season almost here, I am excited to announce that Stubb’s has come out with a new product… Cookin’ Sauces! These sauces will help you creative flavorful, easy skillet and slow cooker meals, even on the days that time is of the essence and your family is hungry for a good warm meal. The Stubb’s Cookin’ Sauces are also certified all gluten-free, all natural and contain no artificial flavors, colorings or high fructose corn syrup. They come in four great varieties, including Bar-B-Q Slider, Chili Fixins, Hatch Chile and Smokehouse Bourbon. Now Stubb’s make it easy for us all to have yummy gluten-free meals made grill-top or stove-top! 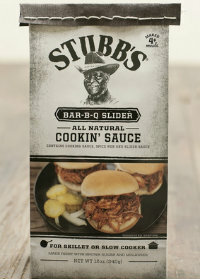 The prize is three (3) FREE product coupons for Stubb’s products (two for the core line of sauces, marinades and rubs and one for the new Cookin’ Sauce). One (1) winners will be randomly selected from the entries received before Tuesday, September 2nd, 2014 at 11:59 PM EST, and one more winners will be randomly selected to win from the entries received between Wednesday, September 3rd and Tuesday, September 9th, 2014 at 11:59 PM. SO – make sure you’re a BeFreeForMe member and enter to win two times! Reply to this blog and let us know the one thing you’ll miss about summer OR the one thing you look forward to in the fall. Me? I’m going to miss summer nights hanging out in my screen house!